Old Crow Medicine Show has invited us to open two shows in August! 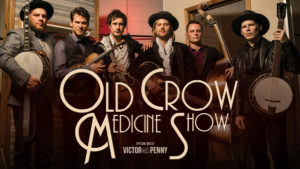 The fine musicians of Old Crow Medicine Show have received the honor of being inducted as members of the Grand Ole Opry, and have won two Grammy Awards: “Best Folk Album” for Remedy (2014) and “Best Long Form Music Video” for Big Easy Express (2013). Additionally, their classic single, “Wagon Wheel”, received the RIAA’s Platinum certification for selling over 1,000,000 copies. They have toured the world playing renowned festivals and venues such as: Bonnaroo, Red Rocks Amphitheater, Coachella, London’s Roundhouse, The Ryman Auditorium, The Barclays Center, New Orleans Jazz Fest, The Fox Theater Atlanta, The Kennedy Center Concert Hall, Central Park NYC, Telluride, and the Newport Folk Festival. Whoa! That’s impressive. When we got the call and the invitation to open for them, we said YES! They’re selling out their current tour all over the US and we encourage you to get your tickets soon. Please join us for these unforgettable shows. TOUR | In other news, we’ve got several Colorado tour dates on the books, including a festival in Creede, CO. We’ve never been to Creede, but we hear it’s gorgeous. We can’t wait to turn the car West and go. MORE | Jeff’s new instrumental jazz group, Jeff Freling Trio, is really taking off. And we made a new thing! We’ve created a weekend workshop event with our dear friend Danielle Anderson of Danielle Ate the Sandwich. Whew! Jump on the V&P summer train – we’re having a ball. Recommending us by word of mouth is still the very best way for us to connect to new fans. Please invite friends who might be interested to our shows – we’d love to meet your people. And, we bet your friends are cool. 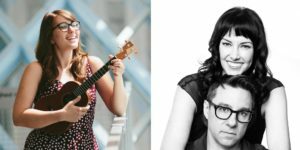 More info on Wonderstruck Ukulele Academy HERE.